With all the hype about the #likeagirl campaign, I'd like to share with you the Moppins family contribution. We have never pushed Diva in one direction or held her back from another because of her gender. Why would we? Are there traits in both men and women that make them naturally better suited for some occupations? Yes, I believe so. However, in my opinion, that doesn't mean that either gender couldn't do those occupations. We saw that to be true in WWII when our women (of which my grandmother was one) on the home front had to take over jobs traditionally held by men. When she was a tiny tot we gave Diva equal access to train sets and tea sets and building blocks and baby dolls. We had and still have, no idea what she will be when she grows up, but nothing will be stifled by us. I am thankful to my parents and grandparents who also made it an non-issue for me growing up. My Paw-paw told me frequently, "Little Doll, go to the top!" He said go to the top, not go as close as you can get to the top, you know, because you are a girl. Engineer and I have tried to give Diva opportunities, equip her with knowledge, present her with information, and instill in her a drive so that she can do and go and be the best at whatever she does. Phillipians 4:13 - "I can do all things through Christ which strengtheneth me." 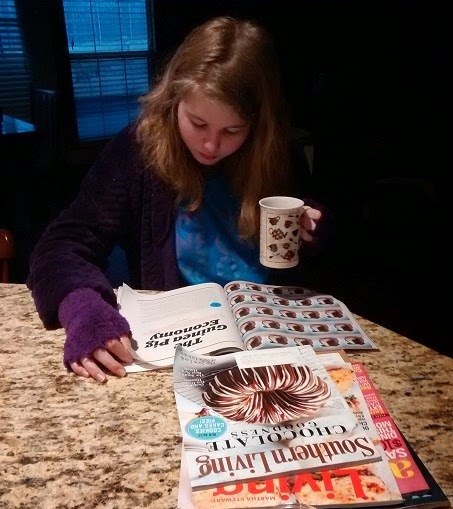 Thirteen year old Diva was reading Forbes magazine at breakfast yesterday. There was a stack of magazines Southern Living, All You, Living, Wine Spectator all in front of her and she chose to read Forbes. She was soaking up information about the economy #likeagirl. Preparing for her future #likeagirl. Making her parents proud #likeagirl. 1-4-3 DM and I cannot wait to see how you live your life to the fullest #likeagirl! Diva is definitely her own person. :) Thanks for stopping by! It really made you wonder what happens in those pre-teen years to make girls think they are less than what they actual are. I refuse to let Diva believe that she is anything but "Fearfully and wonderfully made."